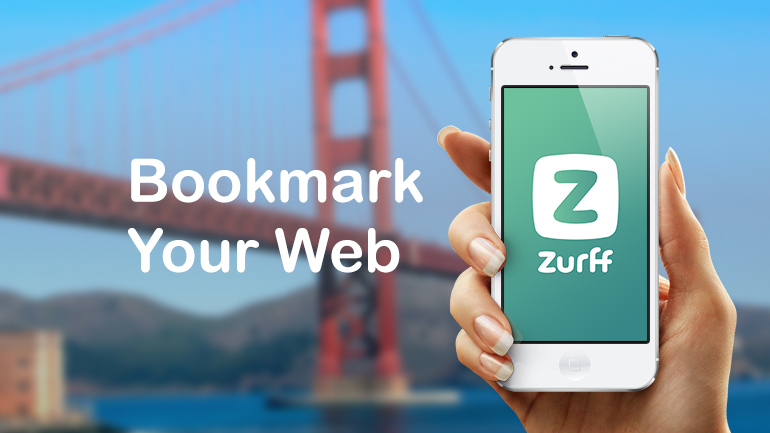 Invest in Zurff and turn this online bookmarking tool into a new digital brand and a global business. Scouted by Pioneers for Most Promising Startup 2015! The new digital brand Zurff, is a personal tool and mobile app for organizing and accessing your own bookmarks, everywhere and from any device. Zurff got scouted in January by Pioneers for the 2015 most promising stars in the startup world. We will participate in this global startup event in Vienna once we have our first product development goals ready. Zurff is a free online tool and app - Just connect and create your name. Once your own personal Zurff page is set up, you can start adding websites and organize them. You can also click on Zurff icons that are available on many websites which will add the website to your Zurff page in just a few clicks. Now you can access your favorite websites from your own Zurff page. Anytime, anywhere and from any device. So why do people on the internet use Zurff? So why fo website owners use Zurff? What are the product USP's? Zurff has been tested with thousands of users for over ten years in the Netherlands. The proven business model is based on a cost per sale advertising model. Users will see a few advertising text links in their account that match their profile, which is based on our own developed algorithm. These links can be to a retailers discount web page, or an offering by a telecom company for example. We also tested the payed subscription model and this works as well. In our pilot project we generated more revenue per user (RPU) than Instagram in the first quarter of 2014. Our 1,250+ users generate $25,000 of revenues per year for one of our customers, a well-known Dutch online retailer selling cloth and other household products. Zurff invites investors to an investment up to €40.000. Build a new scalable state-of-the-art and independent cloud platform. Multi-device and multi-platform user interface based on HTML5 and CSS. Accessible through iPhone, Android and Windows Phone apps. Improved affiliate marketing performance algorithm. Easy registering by social connect. Extensions for world leading cloud platforms. We will not sign any contract that will exceed our total funding. This way we will stay a debt free company. Zurff offers 10 percent of its shares and has a projected investment result of over 500% in three years. You will be an early-stage investor and part of a new well-known global digital brand with future offices all over the world. Investors that invest 10.000 euro or more will receive a 1% sweet equity bonus. Investors that invest 400 euro or more will receive a free copy of 'Everything We Know Is Wrong!' by Magnus Lindkvist. some very successful software projects, including Sitecore (co-founder), Gobike, Stretchboard and Silverflip. Machiel (The Netherlands) has a background as interactive designer and digital art director and has a clear focus on reaching business goals with creativity and user centered design. As co-founder of Online Department, he leads the design team and operates as a user centered design coach in close collaboration with agile development teams for software and e-commerce platforms. Magnus (Sweden), a Trendspotter and Futurologist based in Zürich: “I know nothing about the future and that's my starting point and curiosity fuel. Travelling nearly two hundred days per year enables me to search for answers to the questions "What's going on in the world" and "Where are we going?” Famous books from Magnus are Everything We Know Is Wrong! and The Attack of The Unexpected. Bjørn (The Netherlands) is Founder and CEO of Zurff. Prior to Zurff, he was entrepreneur and managing director with several businesses which he sold successfully. A website developed by Bjørn was voted Top 200 Best Websites 2002 by Elsevier. Bjørn has a passion for innovation, technology, customer strategy and family. He holds a Bachelor degree in Information & Communication Technology. Sebastian ( Lithuania) is a Java architect and our lead developer. He has more than 15 years of experience with Java and Linux. He is also the creator of NoJPA and has many specialties like EJB, J2EE, JPA, JTA, Hibernate, Spring, Solr, Hadoop, AOP, Linux cluster solutions, XEN, Master-worker-design pattern, Lucene so in fact J-anything. For the last fifteen years Helge Tennø (Norway) has assisted companies and organizations in their job to understand digital. He helps top companies and organisations understand the emerging customer dynamics in the context of technology and their business. Assisting in the design of customer activated strategies and solutions. Finding the right frequency is about connecting to your audience, your potential customers. Finding the right frequency asks you to understand the people you want to reach, but also understanding your own message, your own strength and how you can make a difference in the world. Anne a global traveler, communication specialist and an excellent writer, helps Zurff connect to the world. Thousands of people all over the world are getting connected to the internet every second. Almost three billion of them are already connected by computer, tablet or smartphone. They find their way to nearly a billion websites for their work, hobbies, social relations, shopping and many other activities. To find something in this digital world is easy now. Websites like Google and Bing help you find information and websites on the internet. But, once you have found something you don’t want to search for it again. Right? This is where Zurff steps in. Zurff provides an easy way to add, organize and access your favorite websites from any computer or mobile device anytime and everywhere. Something you can’t do using bookmarks functionality from your local browser. The concept of Zurff was founded in 2001 due to the lack of a good cloud solution for managing online bookmarks. Its founder, Bjørn Hascher, used it to manage all his development URL’s and deep links to forums and other websites to do his job properly. It has been running ever since and without a corporation behind it. Many other internet users started using Zurff for managing their own personal websites and still do on a daily basis. Zurff is a free web service - Just connect and create your name. Once your own personal Zurff page is set up, you can start adding websites and organize them. You can also click on Zurff icons that are available on many websites which will add the website to your Zurff page in just a few clicks. Now you can access your favorite websites from your own Zurff page and from any device. Zurff is a scalable product and can be used by all that use the internet no matter if it’s business or personal. It can be used on any platform and on any device. Apps on iPhone, Android and Windows Phone will connect mobile users to Zurff. This is Miranda. Every day she reads two news sites, participates in three forums and is always checking for discounts on a dozen fashion sites. Zurff helps her connect to her digital life daily and can be done at home, while traveling on her smartphone or during lunch break at work. This is Parker. He is a developer and uses Zurff on his laptop and desktop computer during work to check a lot of tech blogs, development forums, test servers and customer websites on a daily basis. Zurff makes it very easy for him to remember, organize and access all these websites quickly and easily. As a website owner you can also use Zurff free of charge for your own benefit. Zurff pages are used extensively and on a daily basis. It can help you increase returning visits and sales once your website has been added to an users Zurff page. Just simply add a Zurff button to your webpage that you would like to be bookmarked. Once visitors click on it, your website will be added to the users Zurff page and will keep them coming back and more often. There are several solutions for managing bookmarks on the market. Though there’s no one like Zurff. The most used (by hundreds of millions of internet users) solution for bookmarking is the bookmarking functionality of the local installed internet browser. However its user experience is not great, you can only access them on your local device and is bound by the browser brand used. When you buy a new personal computer or smartphone, users often lose their bookmarks. There are sync tools around but these are too complex for most users. This is why the potential of getting people out of the browser to an independent cloud solution that has more benefits to offer is huge. So why people on internet use Zurff? A much better user experience than using bookmarks from your local browser or competitors. As a website owner you can also use Zurff free of charge for your own benefit. Clicking links on Zurff pages is used extensively and on a daily basis. It can help you increase returning visits and sales once your website has been added to a users Zurff page. Just simply add a Zurff button to your webpage that you would like to be bookmarked. Once visitors click on it, your website will be added to the users Zurff page and will keep them coming back and more often. Zurff has been tested with thousands of users for over ten years in the Netherlands. The proven business model is based on a cost per sale advertising model. Users will see a few advertising text links in their account that match their profile, which is based on our own developed algorithm. These links can be to a retailers discount web page, or an offering by a telecom company for example. So if the Zurff users are happy and decide to buy something, our advertising customers are happy. We also tested the payed subscription model and this works as well. Many major Dutch brands in retail, travel and telecom, are already using the Zurff platform for years now because the platform generate sales for them and creates returning visitors. Our 1,250+ users generate $25,000 of revenues per year to one of our customers, a well-known Dutch online retailer selling cloth and other household products. Zurff is a scalable business and can be used by all that use the internet no matter if it’s business or personal. Therefore its growth potential is huge. The pilot technology platform is not scalable. This is one of the reasons to build a new platform. The technology and user interface used by the current platform is really old. By building a new technology platform, a new user experience with low entry barriers and making it a global web service with extensions to all the major technology platform, and to build a new digital brand, we want to increase users, revenues, profit and return on investment. Zurff has prepared an international team with a ton of technology and business development skills. We've invested 20.000 euro so far and secured resources for worth another 60.000 euro from the 100.000 euro needed. Once we secured our full funding we will start developing UX Design, back-end programming, app programming and extension programming. All people that browse the internet. Hundreds of millions of internet users still use local solutions beacuse the lack of a great global cloud solution. Tens of millions of internet users use local or hybrid cloud solutions. There are also cloud solutions around. Zurff is one of the first online bookmarking solutions that came to market in 2001. Most of the solutions act in local markets and have no global focus, like MyPIP in The Netherlands or Xerpi in the USA. Others have a payed subscription model, like Pinboard. The main competitors are Delicious (5M+ users) and Symbaloo (5M+ users). So far Delicious have been switching owners a lot and they are struggling with their strategy to create a community with its product. They also struggle with their business model. Symbaloo has a different business model and needs to start a sales organization in every country. They also have another vision about user experience. They both grow though proving market growth. In our pilot we have 1250 users and 10 selected advertising customers. Despite the old technology our pilot tool is running on, users are very happy about our solution and use it heavily and on a daily base. The average use is 2,6 times per day spending 21,1 minutes on Zurff. Build the new product within 6 months. Increase the number of users to at least 1M – 5M in four years. Increase the revenue per active user (RPU) per year to $2 - $3 in three years. The speed of user growth is determined by the quality, performance and user experience of the product, the amount of technology platform extensions, the adoption rate of websites using Zurff extension, the amount of link shares by Zurff users, partnerships with mobile phone manufacturers and the amount of brand support. How are we going to grow? Zurff wants to grow organically in combination with brand support. Organic growth comes from developing a new independent and scalable technology platform that is multi-lingual (twenty languages), multi-device, multi-platform, has sharing functionality and offers new traffic and sales functionality for website owners through extensions with all the major technology platforms. Websites using Zurff extensions wil boost user growth as well. Zurff also has connections with the mobile industry where we will pitch to get the app version pre-installed. To support all this, Zurff will promote its global digital brand as well. Growth of RPU can be achieved by starting a direct relation with customers and cut out affiliate agencies. We can also improve our targeted advertising by implementing our profiling algorithm. We can add more business models as well like payed subscription or e-mail advertising. The big hairy audacious goal (BHAG) : to be the worldwide preferred tool for online bookmark management with at least 10M+ users and an awesome user and employee community. 1 dollar RPU per year. (Revenue oer User). 2 dollar RPU per year (Revenue per User). For full financials download our investment documentation. The growth potential of users is based on market size and competitors growth. Growth of RPU (Revenue Per active User) is determined by the number of active users, enhancements of our profiling algorithm, the number of advertisers, moving from an indirect customer relation to a direct customer relation, adding more business models like e-mail bulletin, other advertising models and payed subscription model. 20.000 euro in product development, preparing the new company, funding costs and putting together an international team. Last January, Zurff secured another 60.000 euro in programming and project management resources. For further developments in this new technology platform and user experience, Zurff is looking for an additional investment of 40.000 euro in return for 10% of its equity. Zurff has set a projected investment result of 500%. Every startup has risks. Even while we have a proven solution and business model. The risk is in the speed of user growth. The quality (awesomeness) of the product is a major factor in this. Therefore we will focus a lot on UX and technology development with a very experienced team that has developed world class solutions before. Zurff will not sign any contract that will exceed our total funding. This way we will stay a debt free company and reduce financial risk.